As some of you may know, I am a Puerto Rican Houngan. Thus my family has it's own traditional practices particularly a tradition known as Espiritismo. Espiritismo is Spiritism practiced in a Hispanic manner. There are many different types of Espiritistas with a wide array of different manners of living their tradition. 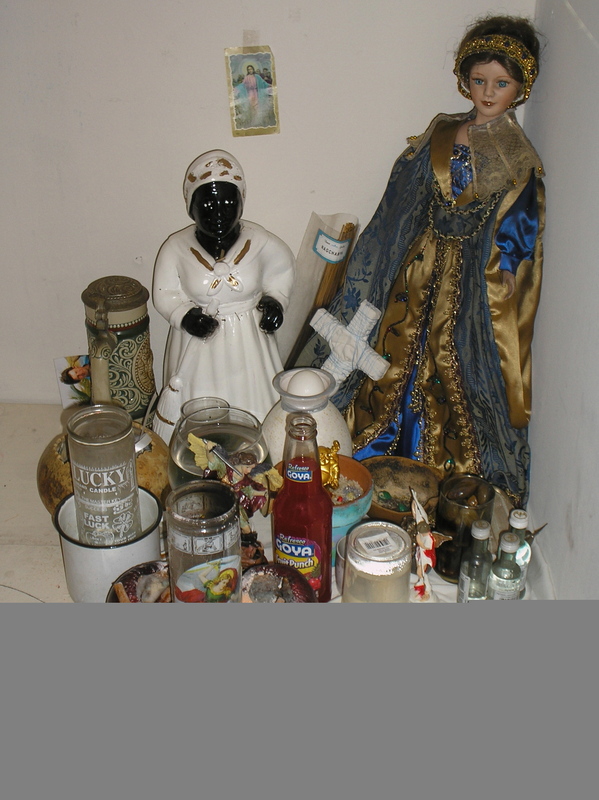 As you also know, the Vodou tradition teaches service of our ancestors, thus I come to you with this topic of discussion. Not too long ago, I removed everything out of my altar-room in order to clean, make space for new stuff, and arrange things differently. Due to the copious amount of things I have in there, this took quite a while and is just recently being completed. Well, I had finished setting up all the Lwa on their appropriate spaces but I never reset my ancestral altar. I just couldn't find space. So I left their things sit and wait until I was able to find the space. Well, after much more re-arrangement I finally came out with a way that would have enough space to please everyone. Since that altar had been out of commision for a while (everything was piled together in a basket), my ancestors came to deliver messages to me. They wanted their space reset and they were a little displeased that everyone else was set up except for them. They also taught me some different works that they would like me to do. As I said before, the way that Espiritistas do things vary from person to person or centro to centro. Many Espiritistas nowadays use a table called a boveda where as I use a Fuente Espiritual. Bovedas are set with seven to nine glasses of water, each representing a guide or group of guides. Family tradition has taught me to use a Fuente however. In the Fuente set up, only one large glass is used. So I took the large brandy snifter that I use as a Fuente and washed it carefully in a mixture of florida water, holy water and water. When it was perfectly clean, I filled it to the brim with clear cool water. I placed a new clean white cloth down on the space that had been made for them. Traditionally, family practice uses the handkerchief of a dead man. One of my ancestors did not want the handkerchief on there anymore and told me to use a new white cloth instead, so naturally I did. I placed the Fuente in the center of the table and could already feel the spiritual energy humming around me. I could feel the elation of my ancestors as I continued to set their table. Towards the back I placed a large doll that has a spirit my grandmother left to me. I placed images of St. Michael on the table and my Madama. I also placed the container of my chinese spirits, the tools of my arabic spirits, and the things that belong to my Gitana (gypsy). I also placed the tools of my Indio (Indian) spirit and everything was set to go. We were ready for a feast! All the foods of the ancestors were carefully arranged on the table. Rice, cornmeal mush, coconut, codfish, yams, cigars, rum, water, coffee, bread. Everything was looking beautiful and coming together so effortlessly and nicely. I grabbed up a handful of white candles and set down to work. I removed a charcoal from the box and lit it, it made beautiful sparks and slowly I laid some incense on it. The sweet smelling smoke wafted up to the heavens as I lit a white candle and began to pray. Softly singing the songs of the ancestors, a deep peace overcame me. As i blew the incense to all of my spirits, I could feel a tingling all over my left side. It was as if my whole left side had gone numb, but it hadn't the usual feeling. My ancestors were there and listening. Removing each plate of food one at a time, I offered it to ancestors praying for their elevation. I prayed for my own well being and the well being of those around me. I slowly made my way through all of the offerings as I saw a group of shiny light globes over to my left. When I turned to look at them directly, they disappeared. I continued speaking with my ancestors asking for the elevation of all the my ancestors, including those that I know and do not know. I slowly left the room allowing them to eat in peace. As I sat on my couch, I could feel the spiritual energy of the altar room spilling over into the whole house. A deep feeling of peace and serenity came over me. I was happy to have served my ancestors and thanked God for the blessed opportunity that He has given me. Soon after I fell asleep. I had many interesting dreams, insights and revelations. When I awoke, I cleaned up the altar. I removed the food and took it to the place where it belonged. I had a great time serving my ancestors and hope that you will do the same. Allow the ancestors to bless you life!! !